While it is disturbing that a federal judge would find it necessary to open with this line, apparently Senior U.S. District Court Judge Sam R. Cummings in Lubbock, Texas, thinks the same way. Judge Cummings has issued a nationwide injunction preliminarily prohibiting enforcement of the U.S. Department of Labor’s “Persuader Rule,” which would have required employers, labor consultants, and attorneys retained by employers to report labor persuader activity to the federal government. 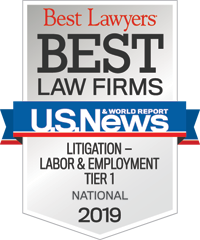 Employers retain lawyers to advise them concerning the often counter-intuitive legal requirements arising under the National Labor Relations Act and the decisions of the National Labor Relations Board, and to represent them in connection with these issues. In recent years, the NLRB’s policies and decisions have strongly favored labor unions and have expanded the scope of conduct policed by the Board into non-union settings farther than ever before. The Department of Labor recently issued a Final Rule interpreting what is called the “advice exemption” to the Labor Management Disclosure and Reporting Act. The new Final Rule reversed the interpretation of the advice exemption that has been in place and well understood for more than 50 years. Simply put, the new Final Rule required employers, and their law firms and non-lawyer consultants, to file reports with the government subject to public disclosure showing any representation (or from whom the employers received representation) concerning direct or indirect persuasion of employees with respect to union representation. This Final Rule was intended, virtually all observers agree, to dramatically limit the ability of employers to get advice concerning labor union activity, including avoiding union activity and union organizing. The rule was scheduled to take effect this Friday, July 1. In his injunction order, Judge Cummings found that the employer-plaintiffs were likely to prevail on their contentions that the Final Rule ignores 50 years of legal interpretation, is impossible to reconcile with the express words of the statute, is arbitrary and capricious, is an abuse of discretion, probably violates the First Amendment, is unconstitutionally vague, and violates the Regulatory Flexibility Act. In short, the Judge found that the Rule was invalid on multiple grounds. We can be confident, based on experience, that the Department of Labor will not accept this outcome. The DOL will undoubtedly appeal and may refuse to abide by the judge’s order. That said, yesterday's decision was a major victory for employers.